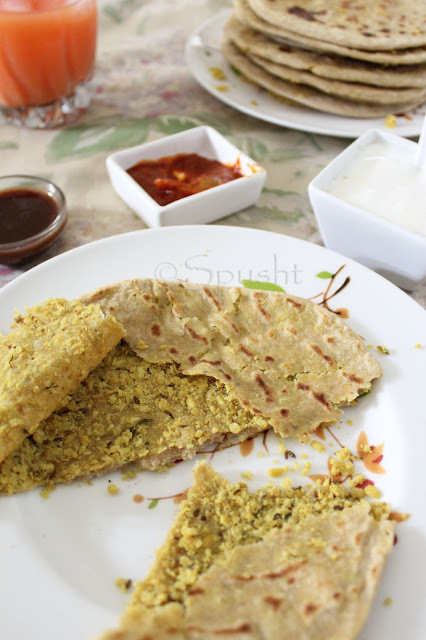 There are times when I don’t do grocery and have very few vegetables at home to make any kind of stuffing for a stuffed paratha. Or sometimes I don’t feel like eating the same old Aloo Paratha (since I never run out of potatoes!). Does that happen with you? What do you do? At such times, I make a Moong Dal Stuffed Paratha. 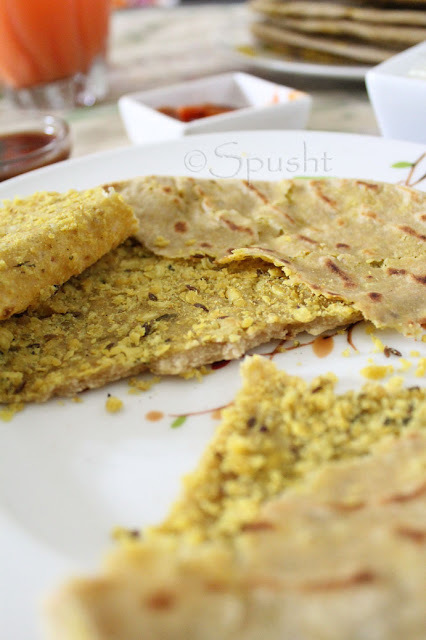 This recipe for Paratha with Moong / Mung Dal stuffing is from Shobha Indani’s book Swad Sugandh. 1. Combine ingredients for dough & knead till it is smooth but a little firm, not very soft dough like roti, a bit thicker than roti dough. Keep aside for 15-20 mins. 2. Wash mung dal few times & drain. Add 2 cups water & 1 Tbsp oil & either pressure cook it until soft or cook in covered pan till it gets soft & water evaporates. Pressure cooking might take around 10-15 minutes, whereas cooking in pan might take around 30-40 minutes. 3. Once mung dal is soft, in the pan add all the remaining ingredients for the stuffing & mix well, cooking it for about a minute or two, no more. The more you cook, the drier the stuffing gets. ** You want a softball consistency that’s easy to roll out – add a little more chickpea flour*** if required. Let the stuffing cool down to room temperature. 4. Divide the dough & stuffing in equal portions, remember that the stuffing balls have to be smaller than dough balls, otherwise the stuffing will tear the paratha. Make it in any shape & size you want. 5. 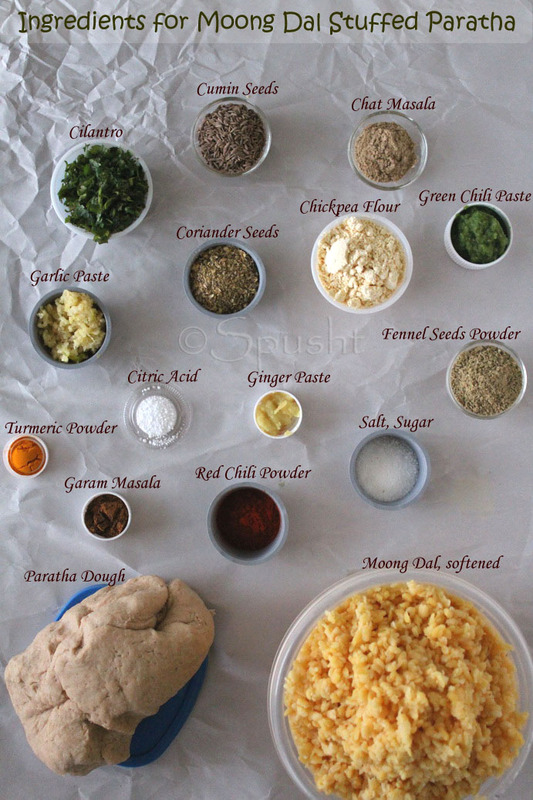 Take 1 ball of dough & roll it out in a small circle. Place 1 ball of stuffing in its center. Fold all four sides of dough to enclose stuffing. Gently press to seal edges. Now roll it out larger, try not to let the stuffing ooze out. Shallow fry both sides using ghee/oil till golden-brown. 6. Sprinkle chat masala on hot mung dal parathas, top it with a lob of butter & serve hot with pickle, chutney, raita or plain/seasoned yogurt. * Use finely chopped green chilies, grated ginger, or finely chopped garlic if you don’t have pastes; doesn’t make a difference. ** If you cook for long time, the stuffing starts to dry up and doesn’t roll well inside the dough. When the stuffing is malleable, it’s easier to roll out the paratha. *** Chickpea flour (besan) helps keep the stuffing together like a dough. It may be omitted. Lovely and yummy filling... New kinda stuffing for me!!! Healthy and hearty filling! Must have been yum. Looks delicious! Hi Nisha, This is good and healthy recipe, loved the pictures :). very delicious n healthy parathas,yummilicious!! That looks delicious...and is one of my favorite...Have a version of this at my space as well. I have thought of making these before but I stopped myself thinking I am being foolish. Thanks this post gives me confidence to make these parathas. I love the pictures of the ingredients, beautiful snaps. Looks extremely appetizing... great clicks. keep them coming..! Its amazing how many foods are out there I would love to cook. Wow!,a healthy loaded Parotas Dear.Luks appetizingly yumm. I LOVE parathas...and this one looks even more delicious than the ones I've had. Thanks for sharing! I was totally thinking of kachori too.. its like a 2 in one treat.. kachori + paratha and not fried! Moong dal parathas look awesome. I've never tried this filling yet! Looks great and healthy too!! 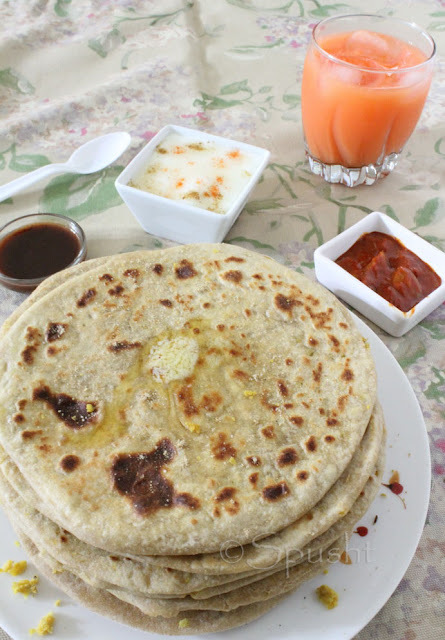 I prepare chana dal stuffed parathas at home, will try moong dal also now..thanks~!